Serendipity as defined on dictionary.com is as follows: an aptitude for making desirable discoveries by accident. Well, if that's the case, then this accident became VERY desirable in the end! Let's just say that the end result card wasn't the first attempt. I KNOW! My stampers here think I never make mistakes, but I just gotta tell ya - one more time - that if I didn't make mistakes, I'd never grow in my stamping. So let's see if you think this mistake constitutes ART! If you remember, or took a peek at last Thursday's card, you know that there was a pretty spray of flowers at the bottom right of the front panel. Well, they started off pretty on this card front too, but since I forgot that Basic Gray ink IS NOT water resistant, the edges of the flowers all ran together when I used my Aqua Painter to color them in. Yeah, not smart, huh? In reviving this background, I decided to add to the collage look and pulled out the Notably Ornate Stamp set. I inked up that gorgeous frame stamp with Basic Gray, stamped off one time and added a partial image to the cardstock. Next, I inked up the dove image in Pink Pirouette and just had him flying up from the frame corner. A few tiny Basic Pearls added to the frame gave it a little pizazz, so I moved on to covering up the muddied corner. There really was no hope for rescuing the stamping, so I took out my 1 3/4" Scallop Circle Punch and punched 4 pieces of the First Edition Specialty Designer Paper. I sponged the edges of all the pieces with Crumb Cake Classic Ink then crumpled them all up into little balls of paper. I smoothed them out a bit and added a Pink Pirouette 1" Circle to the center. After punching a hole with my Paper Piercer, I added an Antique Brad to the center - and Voila! - you have a shabby chic flower! So, that flower covered the worst of the muddy stamping - but I still needed to cover a little more, so what better way than to add a greeting? I stamped the label image from Notably Ornate on Very Vanilla with Crumb Cake Classic Ink then punched it out with the 2" x 1 3/8" Oval Punch. I topped it with a Pink Pirouette punch piece from the Modern Label Punch then added my greeting. 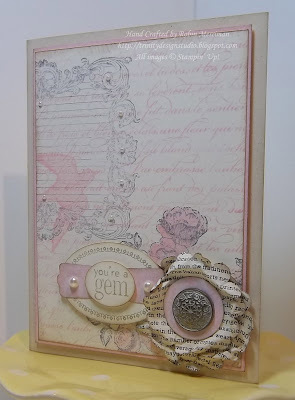 That came from the You're a Gem Stamp Set and I punched it out with the 3/4" x 15/16" Oval Punch. It was adhered to the other punch layers with a Stampin' Dimensional and the whole thing was added to the card front with more dimensionals, just like the flower. Two Basic Pearls were added to the pink punch piece for a little more bling. In case you couldn't tell, everything on the card was sponged with Crumb Cake Classic Ink to make it look more vintage. Once I had the card front finished, I decided to add a layer of Pink Pirouette cardstock behind it, then the whole thing was added to a card base of Naturals Ivory Cardstock with Stampin' Dimensionals. So, it's pretty over the top - hey I never said rescuing a card would be simple! I used a LOT of supplies, but I sure do like the end result! Sometimes you just need to challenge yourself to see where your imagination can take you and what better place to start than with something that was destined for the trash pile on another day? You can't ruin it at this point, so why not just go for it?! Feelin' adventurous? Need some supplies? Ok then, you can get all you need to recreate this card by visiting my Online Store. The supply list is below, so check it out and let me know how it goes! Click the Shop Now Button at the top right of the page!